More than 50 self-defense fighters and as many civilians have been killed since Ukrainian troops stepped up their offensive in the region on Monday, according to the PM of the self-proclaimed Donetsk People’s Republic, Aleksandr Boroday. Boroday spoke to journalists next to a morgue in Donestk where identification of the bodies is under way. “Two of our Kamaz trucks were fired at from the air and from an ambush on the ground. Shooting the wounded runs contrary to all international conventions,” Boroday added. He said the significant number of casualties could be explained by extensive use of air force by the Ukrainian military on Monday. Chairman of the Donetsk People’s Republic Supreme council, Denis Pushilin, also estimated that around 100 people might have been killed by Ukrainian troops. It’s still “impossible to pick up all of the dead bodies as snipers are shooting at anyone who tries to come near them,” Pushilin said. Footage by LifeNews shows a truck full of dead bodies. Representatives of the self-defense squads say they cannot yet give the names of those killed; the process of identification has only just began. Also overnight, self-defense forces reported that Ukrainian military opened fire at an ambulance transporting two injured from the Donetsk airport. The doctors inside the ambulance were unharmed, deputy of Donbass’ self-defense forces, Sergey Tsypakov, told RIA Novosti. The two wounded remain in the ambulance and it is not possible to evacuate them at this point, he added. This comes as the Ukrainian military is broadening its offensive against anti-Kiev forces in the southeast of the country. 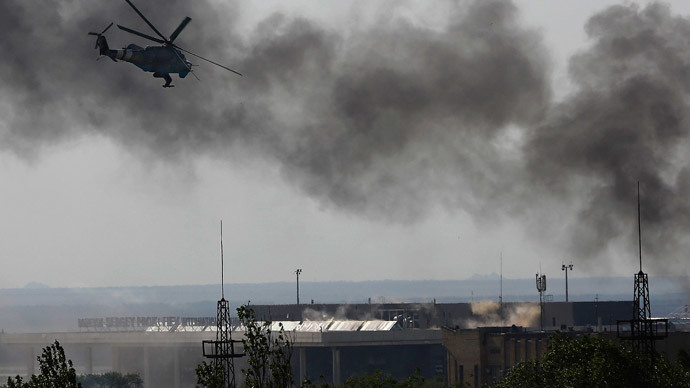 The fighting in Donetsk continued throughout the night around the airport, which was on Monday taken under control by Ukrainian troops, after they unleashed fighter jets and helicopters at the armed self-defense forces, who occupied the airport earlier in the day. Boroday claims the troops also suffered losses. Ukrainian Interior Minister Arsen Avakov, however, denies any casualties on the army side. "The airport is fully under control. 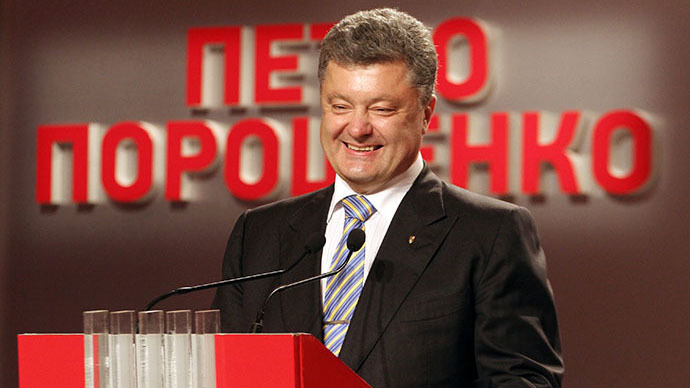 The enemy sustained serious losses, we have none,” Avakov said on Tuesday, as cited by the ministry’s press service. A self-defense fighter called Evgeny, wounded in the fighting at the airport, told RT the National Guard wasn’t just shooting at military targets. A video posted on YouTube reportedly shows Ukrainian jets attacking the area around the airport on Monday. Airstrikes started after the self-defense forces failed to comply with the ultimatum put forward by Kiev's troops, that is to surrender by 1pm local time, Vladislav Seleznyov, the head of the counter-terror operation said on his Facebook page. The State Aviation Service halted air traffic through the airport till 9.00am local time Tuesday. 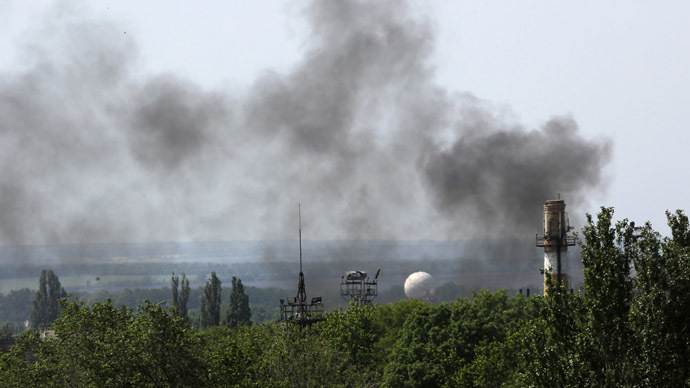 Loud explosions and gunfire were reported from Donetsk throughout the day, with Ukrainian army aircraft occasionally circling around the airport. Also on Monday, at least three civilians were reportedly killed and several wounded when the Ukrainian military launched a mortar attack on the town of Slavyansk in eastern Ukraine. 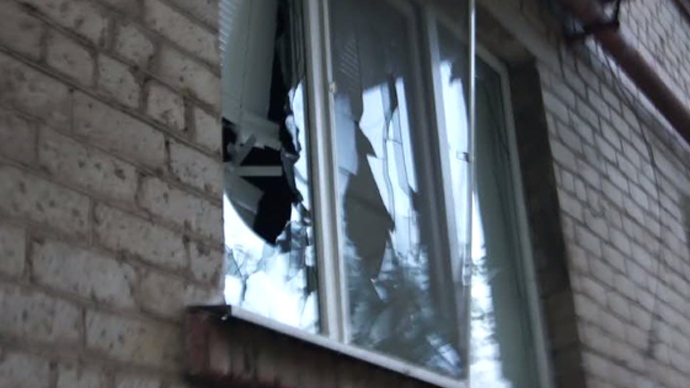 The clashes in Donetsk began just a few hours after the early results of the elections were announced. Ukrainian confectionary tycoon Pyotr Poroshenko is winning the presidential election in the first round of voting, having secured more than 50 percent of votes. Government troops will go on with the military operation until not a single self-defense fighter “is left on the territory of Ukraine,” said Vice Premier Vitaly Yarema, as cited by RIA Novosti. Yarema said the military operation was suspended on May 25, the day the presidential election was held in Ukraine. “It has now been resumed, we saw the results yesterday,” Yarema said on Tuesday. He did not specify how long the operation might take. President Putin once again urged “immediate termination of the military punitive operation in the southeastern regions [of Ukraine] and a launch of peaceful dialogue between Kiev and the regions,” says a statement issued on Tuesday by his press-service.